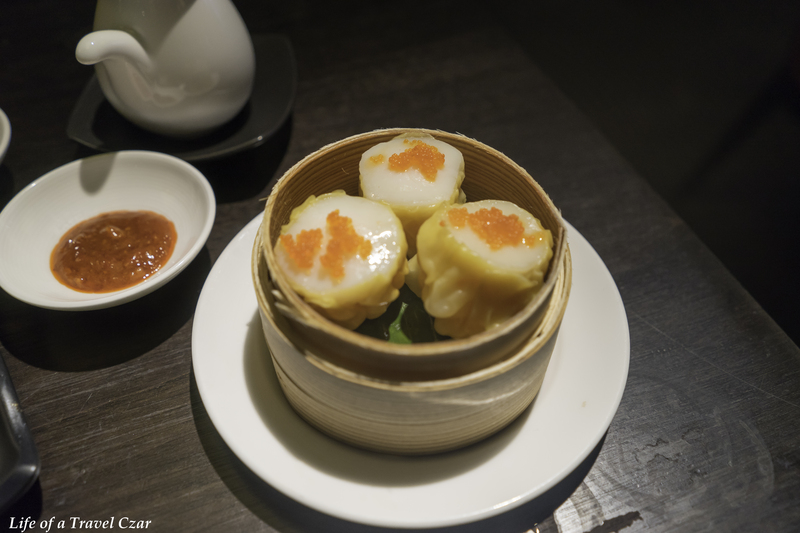 The dumpling has it all; succulent scallop, minced prawns, a wonton wrap with tobiko caviar on top. It’s everything working together in harmony that makes this a satisfying taste experience – the fresh saline flavour of the scallop, the richness of the tobiko caviar, the succulent mince prawns and the soft wheat-based steam dumpling skin which holds it together. 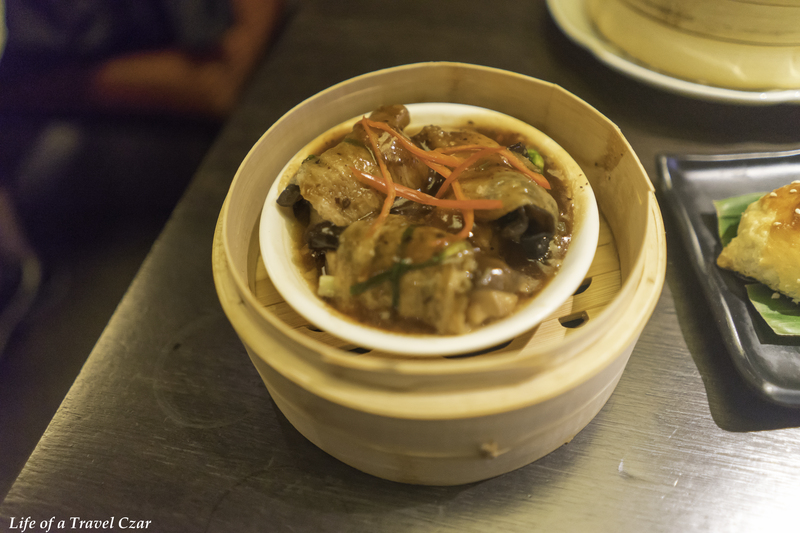 The soft “fall-apart”, “melt in your mouth” seabass is a pure treat with its distinct flavour, the mooli struggles to hold it together and doesn’t seem to pack a bite, while the distinct black bean flavour lends its impressionable touch to the dish with its deep salinity. A lovely dish indeed. 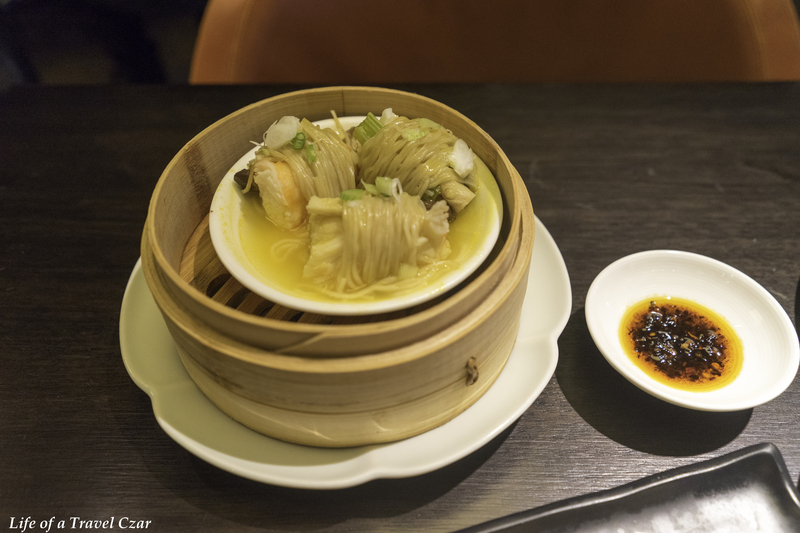 The succulent king crab is combined with a buttery soft soupy base and soft noodles. The noodles add weight to the dish, but the real natural flavours of the crab shine and dominate the dish. This dish is about the buttery crumbly flaky pastry pastry filled with rare dices of venison. The venison is mixed with hoisin sauce for a sweetness touch to match the game flavour of the meat. I opt for a lovely Chablis to match the seafood dishes. The Chablis has a beautiful whiff of citrus and floral notes to introduce itself. On the palate the beautiful fresh green apple flavours shine with the flow of the Chablis’ creamy texture and its lively and fresh minerality. 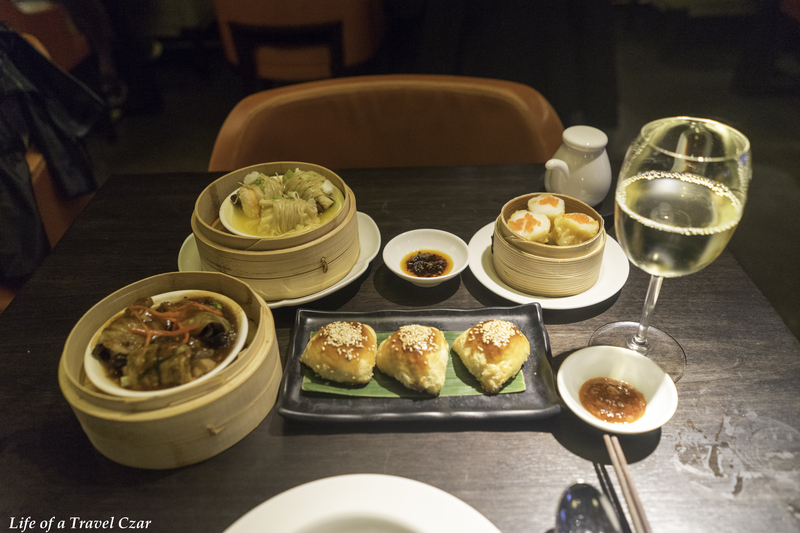 The wine works perfect with the rich seafood dishes. 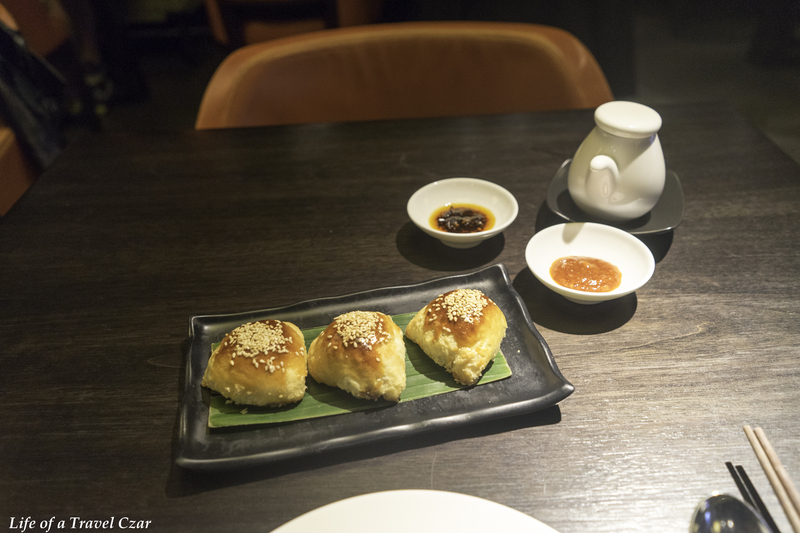 The dish is three super crispy and crunchy fried scroll shaped dumplings with succulent peppery wagyu beef inside. The wagyu is rich and buttery and the sauce of the filling softens the batter casing in your mouth for a wonderful taste experience. It is a textural taste experience! I pair this dish with a lovely glass of Rioja. The wine has deep perfumed aroma with hints of dried fruit notes. 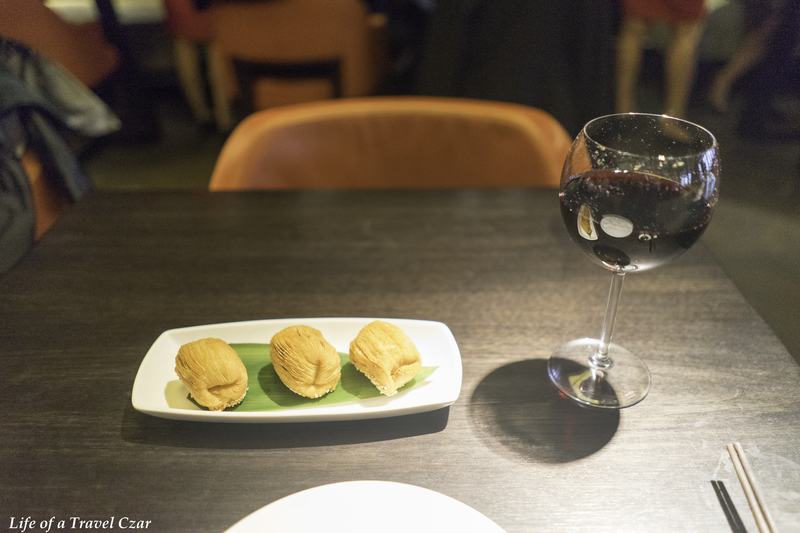 On the palate the wine displays good fruit intensity of blackcurrants, cassis liqueur with hints of savoury and sweet spice to provide a strength to match the wagyu and chill the senses on this Friday. A wonderful way to spend a Friday in London!